Hannah is a native of Tucson, AZ. Her love of music began early on when she started studying piano with her mother at age 4. At age 6, Hannah began her harp studies. Over the years, she continued to play both instruments, studying classical repertoire. Hannah attended University of Arizona, where she completed her Bachelor of Arts in Music in 2012. During her time there, she was a member of a touring harp ensemble, HarpFusion, with whom she performed in Brazil and China. She continued her private piano studies during college and served as a pianist for several church congregations. She served as a piano accompanist for multiple vocal and instrumental majors at Martin Luther College from 2014-1016. Hannah earned a Master of Music in Harp Performance from University of Minnesota, Twin Cities in 2017. She is currently pursuing her Doctor of Musical Arts in Harp Performance at University of Minnesota. In January 2017, she was featured as a harp soloist with the UMN Symphony Orchestra, where she performed Debussy’s “Danses Sacree et Profane.” She currently serves as pianist for a local congregation in the Twin Cities metro, and enjoys accompanying vocalists and instrumentalists. Hannah has held private students in both instruments over the years. 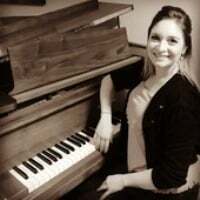 She enjoys working with students of all ages and describes her teaching style as “nurturing and fun.” She hopes to instill a love of music in all her students and help them achieve their musical goals while enjoying the process. She believes that each student has a unique method of learning. Therefore, it is important to her to work closely with both students and parents to develop their musical goals in order to better serve them. Hannah is looking forward to continuing to grow as a teacher with All Things Musik! When she is not playing her instruments, Hannah is usually spending time with her 3 year old daughter, enjoying a walk in the park, or dancing!